The sounds of the traditional Indonesian orchestra known as the gamelan have enchanted Western explorers for centuries. In 1580, Francis Drake described the music in his logbook as "of a very strange kind…pleasant and delightful". Gamelan is one of the most distinctive, refined and immediately recognisable music ensembles on our planet. Initially, it sounds utterly strange to most Western ears, despite having deeply influenced many classical composers including Debussy, Britten and, more recently, Steve Reich, not to mention a vast number of avant-garde musicians experimenting with tuning systems. Generally speaking, and allowing for all the cross-pollenization that inevitably occurs, there are three main types of traditional gamelan style, identifiable by region - Balinese, Javanese and Sundanese. However, throughout Java and Bali, gamelan is simultaneously both foreground and background - it neither dominates nor is dominated. The music develops horizontally, rather than vertically, has little in common with chord-structured work, being circular as opposed to having a linear development. It's hard to imagine this music ever having been dreamt up in the cold, grey northern hemisphere. It is music you ideally want to listen to outdoors, on a warm afternoon, echoing to some extent the environment in which it was made. On many gamelan recordings you can clearly hear crickets, cicadas and birds chirping away in the background, subtly adding their own melodic fragments to this beautiful music. I first heard the much-loved piece 'Puspawarna' a couple of years ago and it evoked a whole range of sensory memories, some real, some unreal - the smell of freshly-cut grass at primary school; the vision of a cohesive tribe of friendly people on some faraway land at dusk; the sound of a distant ice-cream van on a hot summer afternoon heard from a platform at Dunbar railway station. I've been addicted ever since. Unlike in the West where we have booze-fuelled, sweaty folk sessions in local pubs and barn dances at one side, and high-brow, expensive classical music at the other, gamelan is classical music and folk music at the same time - for instance, many villages in Central Java have their own set of instruments yet benefactors contribute to the continuation of cultural events in the main gamelan centres of Yogyakarta and Surakarta. This is an excellent testament to the inclusive nature of Javanese society - a knowledge of which leads to a much broader understanding of the music itself. There are several gamelan groups in America and Great Britain but obviously it's much better experienced and more easily understood in the context of Javanese and Balinese life. Gamelan in Central Java has a number of roles - as accompaniment to wayang orang or wayang kulit cultural puppet and dance shows, ceremonial functions, frequent radio broadcasts and just for its own sake. Children are actively encouraged to play from a young age and many schools have a gamelan club. The majority of gamelan instruments are of the tuned bronze percussion variety - the onomatopoeic and kettle-like kenongs and ketuks, instruments similar to Western xylophones and the most revered instruments of all - the gongs. The large gong, gong ageng, requires a vast amount of skill both on the part of the man who literally spends weeks making it, and the player whose role it is to provide the most fundamental and precise punctuation. However, in a manner which mirrors Indonesian society, the individual instruments work together to create something above and beyond their respective parts. Even the voice, when used, is regarded as another instrument rather than something to be 'backed up' by music. The instruments interweave to create a mesmerizing, meditative, syncopated, ambient-esque flowing symphony of shimmering bells, melodic ripples, effortless tempo changes, "moonlight poured over the fields". It's a relaxed yet complex musical tapestry of repetitive, intricate hypnotic patterns, not unlike the popular traditional Javanese textile batik, or even the incredible weaving of motorcycles and bajajs on the roads of Indonesian cities. It often sounds improvised, yet most gamelan music is composed so meticulously that each note, on each instrument and at each moment, sounds 'inevitable'. The instruments themselves are constructed and tuned according to different systems from the 12-tones-to-an-octave system we have ingrained in the musical psyche of the West. 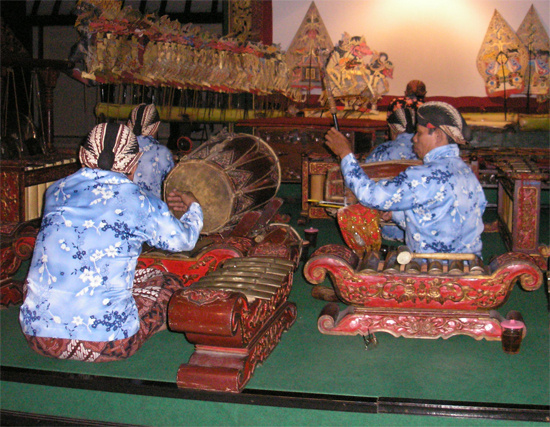 There is the five-toned slendro and seven-toned pelog - some gamelan sets have both slendro and pelog instruments, and there is evidence that a three-toned set was used as long ago as 347 AD. It is actually considered a minor insult to copy the tuning of one gamelan set exactly for another so no two sound exactly alike. Recordings of gamelan performances have been available on 'world music' labels since the early twentieth century - notably the Nonesuch Explorer Series and out-of-print Ocora labels, both of which mainly concentrated on music from Yogyakarta and Bali. More recently, Italian gamelan enthusiast and producer John Noise Manis has been documenting a vast range of styles and repertoires from Yogyakarta's rival cultural town, and neighbouring gamelan centre - Surakarta, known locally as Solo. Solonese gamelan is said to be the most delicate and refined in Central Java, echoing the mental states needed for prayer, concentration and self-discipline. Manis first became interested in the Balinese gamelan but soon became even more spellbound by "the depth and articulation of the music of Central Java which revealed itself as a valid match to Western classical music". Over the last decade Manis, and his not-for-profit Yantra Productions organisation, has seen the release of a multitude of fabulous recordings, including everything from introductory gamelan compilations to an eleven-disc (and counting) series for the Felmay label. Of this series, Volumes X and XI - Sindhen Trio and Music of Remembrance - were released in February. The former includes two innovative vocal works featuring voice alongside the usual metallic gamelan instruments plus the stringed instrument known as the rebab, the plucked siter and the suling (flute), and a delightful, tranquil summery instrumental. The latter, as the title suggests, is a collection of five pieces that might be used for commemorating the dead. Also out on the Sargasso label is A Javanese Gamelan Sound Library, a collection of individual instrument samples, perfect for bedroom software composers interested in creating 'unusual' tonal shades and soundtrack scorers alike. And this month sees the release of the first two CDs of a new series, Gamelan of Java, for the Lyrichord label. Kraton Kasunanan was recorded at the Kraton (Royal Palace) of Surakarta and presents two instrumental pieces and one piece from the Kraton's ancient dance repertoire. Contemporary Composers features six varied compositions by six musicians of ISI (Institut Seni Indonesia) Surakarta and is perhaps the most important - highlighting the fact that gamelan is an evolving, contemporary music as well one of the most fascinating cultural heritages of the world. This balance between tradition and respectful experimentation is a very interesting subject of study. Unsurprisingly, many Indonesian youngsters are more seduced by the noise pollution of generic, globalised American pop than the ancient traditional art of gamelan playing. As Manis says, "contemporary musicians are very cautious in creating new music. The 'weight' of tradition and fear of older masters' criticism are very much felt. So they feel more at ease, when composing new works, in following the route of Western experimentalism. The attitude of the younger generations in Java is the same as in other parts of the world. Western and western-influenced pop music are prevailing. Traditional music is alive in certain contexts: the art schools, the Kratons, the national radio. Also, certain ceremonial functions and the shadow-puppet theatre help maintain the tradition." Manis himself is doing a great deal to support the continuation of this incredible music, and both he and the musicians of Solo should be congratulated.